Ranking The Different Line-Ups Of THE WIGGLES | Warped Factor - Words in the Key of Geek. Get ready to wiggle argue about which line-up The Wiggles is the best. 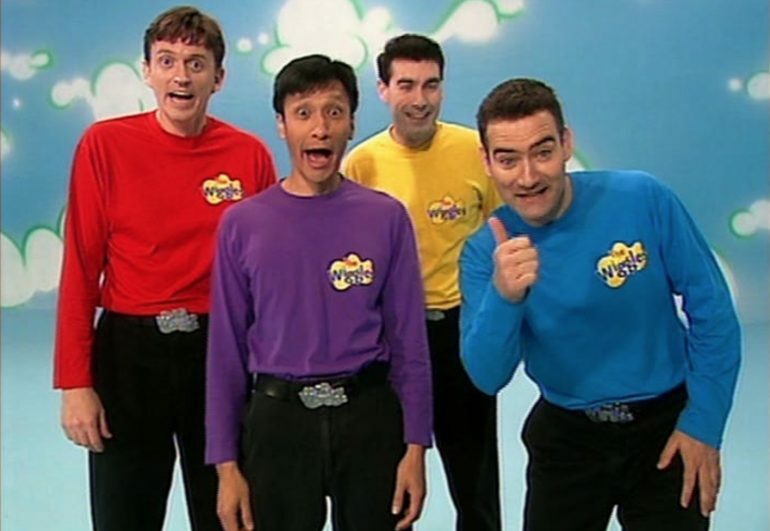 If at any point in time in the last 25 years you've gone on the wild ride that is parenthood then chances are you've encountered the Australian phenomenon which is The Wiggles. To date they've recorded close to 76 million songs for children and released almost twice as many DVDs. 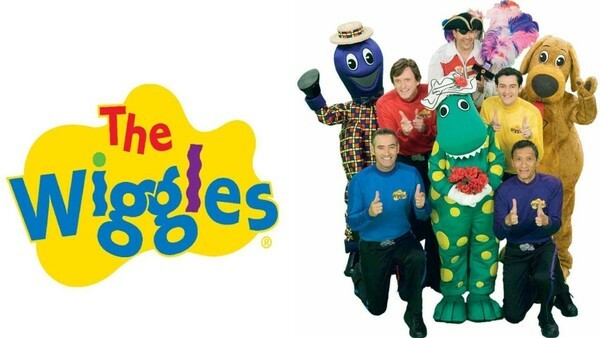 They've performed more live shows than there have been episodes of Neighbours and Home and Away combined, and have featured a revolving line-up of different full time lead Wiggles across the years. After a controversial year in 2012 (more on that later) and the retirement of all but one of the original members, The Wiggles reinvented themselves for a new generation of pre-schoolers. To be fair, The Wiggles audience does refresh every few years as children grow up and move on so the kids are likely to be more accepting of the change than their parents. However, something's really not quite right here. The only original member to stay on is Anthony, although you'd be excused for not recognising him. He's still wearing the blue skivvy but has a look behind his eyes as if to say "kill me now". His face is devoid of any expression, thanks to the amount of surgery he's clearly had over the years. Look at the picture above, there must be a massive bulldog clip on the back of his head stretching all that skin so tight. And then there's his teeth! Oh, his teeth!! They are now back-lit by their own power source. Which I guess comes in handy when taking the Big Red Car out for a spin at night. Anthony still likes to eat fruit salad (yummy, yummy), but he's sorta like Disco Stu from The Simpsons in that he just won't accept his era is over. Really it would've been best to make a clean break and have four young, fresh faces front the group instead of his old, stretched face forcing itself to the forefront on every occasion possible. 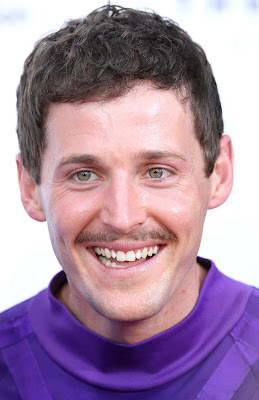 Moving on to the new inhabitant of the purple skivvy and we have Lachlan, who has basically taken over all of Jeff's traits. He sleeps, he plays keyboards but unlike Jeff (as far as I know) is sleeping with one of his co-stars! Oh, and he briefly grew a whispery little mustache. Which was just weird. In the red skivvy we have, and I swear to god I'm not making this up, who my young daughter refers to as Creepy Wiggle (a name she never gave to previous red skivvy wearer Murray). Even after seeing Lachy's little man-boy mustache, the red Wiggle is still the one she calls Creepy. Confusingly Creepy Wiggle has taken on much of the band's responsibilities that came with the yellow skivvy, as in lead vocal duties, but without any of the charisma usually associated with it. Honestly, I can't remember his name, so he will forever be Creepy Wiggle in my house. She's up all night to get Lachy. If you didn't already know that this line-up existed then you've just had your world rocked, right? Watching online clips of the short lived Latin America Wiggles and the Taiwanese Wiggles is a great way to pass the time. It's like the weirdest cosplay tribute bands ever. Or some bizarre hallucinogenic dream. The Taiwanese Wiggles, later re-titled The Mandarin Wiggles (possibly in honour of Anthony's favourite fruit salad ingredient), made their wiggly debut in 2002 as pretty much a Taiwanese clone of the original line-up. Apparently the group were packed off to Sydney and underwent six weeks of grueling basic training at Wiggle boot camp (that's a thing) before they could even begin to point their fingers and do the twist. They enjoyed huge success in Taiwan and even went through their own cast changes over the years before finally hanging up their skivis in 2007. The Latin American Wiggles were their Spanish speaking counterparts. Two females fronted this formation, alongside a yellow skivvy wearing whsipery mustached string bean of fella (maybe this was where Lachlan got the idea from?) and someone who sorta looks a little like a Spanish Johnny Galecki (see above and tell me there's not a Puerto Rican version of The Big Bang theory missing its Leonard), but they didn't enjoy anywhere near as much success as their Mandarin mates or the Antipodean originals. The reason for this is that research discovered Hispanic parents preferred sitting their children in front of the English speaking line-up as it helped the little 'uns learn the language. In 1991 five fresh faced youngsters were getting ready to wiggle. That's right, FIVE Wiggles! Legend has it that whilst attending Macquarie University Anthony Field had the idea to record an album of children's songs. He contacted Jeff Fatt, an old band mate of his from his days in The Cockroaches, their ex-roadie Gregory Page (who at this time was sporting a very Vulcan inspired look) and fellow Macquarie mature student Murray Cook to collaborate on his idea. The foursome received songwriting help from John Field, Anthony's brother, and from Phillip Wilcher, who was working with the early childhood music program at Macquarie. Wilcher claims to have "contributed the most musically to the debut album" and documents archived in the National Library Of Australia (that's a thing) support Wilcher's claim. They also suggest that if it was not for Wilcher the whole project might never have happened as he also financed the majority of the 1991 eponymous debut album. At the time of recording the general consensus among the band was that this was a one-album experiment, but soon a contract for two further records came their way. The following year Wilcher returned from a visit to the United States and was told that the group did not need him, and that a second album Here Comes A Song had been taped while he was overseas. Wilcher says he has no idea as to why he was kicked out of the group. The other four Wiggles, however, dispute this account, saying. "There is no story. There was no fight, no fallout. Wilcher was just not so much into children's music, he was more into classical music." He's since been erased from Wiggle lore, and the debut album re-recorded without him. 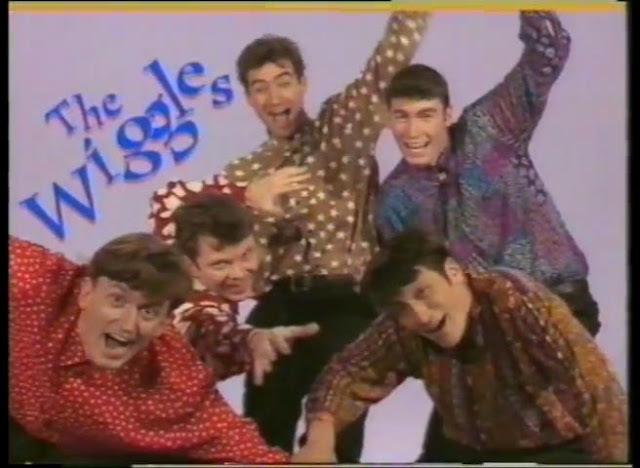 Wilcher's departure was a right hot potato (potato, potato, potato), and it wouldn't be the only time a Wiggle was unceremoniously dumped without warning, but whatever went on behind the scenes this original line-up was the start of the wiggly monster which would go on to much greatness. This is the line-up most people think about when you mention The Wiggles. Spanning 14 years from 1992, and a brief reunion in 2012, Greg, Anthony, Jeff and Murray (who to this day remains the only Wiggle that I've randomly hi-fived whilst walking around Guildford town centre) toot. toot, chugga, chuuga'd their way around the world and into the hearts and ears of youngsters across the planet. They released album after album and toured relentlessly until Anthony finally had enough money for his first nose-job, but a decade of wiggling had taken a toll on their bodies. Anthony nearly left the band in 2004 due to ill-health, then the following year Greg underwent a double hernia operation forcing him to withdraw from the band's U.S. tour after being diagnosed with a chronic illness called orthostatic which saw him suffering repeated fainting spells, slurred speech, fatigue, and trembling. 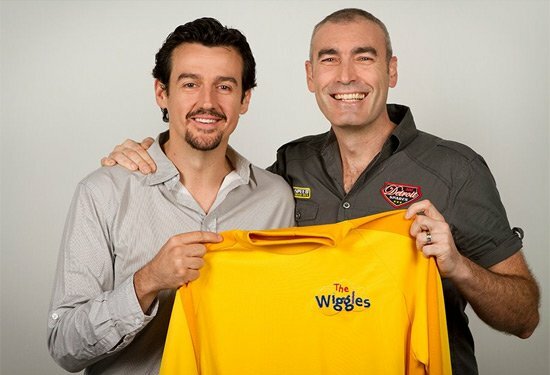 On 29th November 2006, The Wiggles announced that Greg Page would leave the group due to poor health. What could've very easily have been the end of The Wiggles was actually the beginning of something very special. Taking absolutely nothing away from Greg's amazing contribution to the band, this was the very best line-up of The Wiggles. Sam began performing with The Wiggles as far back as 1998 and in 2002 became Greg's understudy. After filling in for him over 150 times, Sam was officially bequeathed the yellow skivvy. But all good things must come to an end when in January 2012, amidst a great deal of controversy, Sam's dream job was ripped away from him! He was called into the office on his holidays and told that Greg had regained his health, was returning to The Wiggles and he wanted his yellow skivvy back. 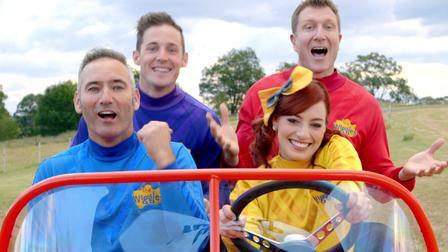 The press were quick to point out that the manner of Sam's departure had been mishandled and had potentially damaged The Wiggles brand image. The official word from the band was that they "could have handled the communication and management of the transition better". Murray later admitted that they were shocked by the backlash in the press and among the parents of their audience, and it wouldn't be long before he, Jeff and Greg decided to retire for good. Truth be told, all line-ups of The Wiggles have been great in their own way. They've bought a lot of joy to a lot of children. And parents alike. But for this parent, Sam was by far and away the best driver of the Big Red Car, and along with Jeff, Murray and Anthony their era reigns supreme. Which is your favourite wiggly line-up? Let us know in the comments below.